Desiderata is Latin for "desired things" and is a stunning home set on 10 acres and has breathtaking 360 degree views of the valley with mountainous landscapes surrounded by farmland. Go for a walk up Walkers Lane; relax in the hammock or cocoons on the large sun drenched veranda; sit in front of the volcanic rock chimney fireplace with a glass of wine; entertain in the indoor/outdoor living room; cook up a storm in the gourmet kitchen; read a book in the mezzanine library or just watch a movie in the entertainment room....there are plenty of options. The house has a large open plan feel with private areas available. There are 3 bedrooms; one king bedroom with amazing views and 2 queen bedrooms with views. The main King bedroom has bi-fold doors that open up on its' own private balcony with outstanding views...please see photo's. It also has its own en-suite bathroom. Every room has air conditioning, fans and electric blankets and the bedrooms have their own TV with the 2 queen bedrooms having their own DVD player, if sanctuary is needed or agreeing on which movie to watch is difficult. The theatre room is sound proof and set for comfort and enjoyment with a very large flat screen TV and blue ray DVD player. We have over 300 DVD's to choose from. Living areas also feature bi-fold doors which completely open to the outdoors, both at the entertainment areas and back of house opening it up to the amazing views outside. We have a mezzanine floor which is used as a study and library or sanctuary for meditation. We have quite a library of books available to suite different tastes for you to enjoy. The house is primarily aimed at couples/families wishing to have a relaxing break. The house has a beautiful warm feel and has been designed to cater for every need or desire. It is perfect for 6 people but we have a mezzanine floor with a pull out queen size bed which is suitable for one adult or 2 children. As there is a spiral staircase the children must be able to go up and down a staircase safely and with confidence. The gourmet kitchen is a chefs delight including sunbeam cafe series espresso machine and we provide the Italian ground coffee beans for your enjoyment. There are two portable cots and two hi-chair available upon request. No further words are necessary, the photos speak for themselves. 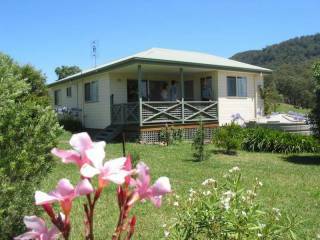 - and all other bookings are a minimum of 2 nights, except for Christmas and Easter which is a minimum of 4 nights. Some pets allowed so please enquire. Note: Variances can be agreed on but only by arrangement with the Property Manager in writing. Deposit of 50% non refundable is required to secure the booking. Payment of the rental deposit constitutes the clients acceptance of these Terms and Conditions. Balance of the rental amount must be received in full 7 days prior to occupancy. If not the Property Manager has the right to cancel the booking and attempt to re let it. The property manager will send you a reminder email. Cancellation if caused by the client, money paid is not refundable unless the house is re-let for the entire period. If a refund is made due to the property being re-let then a $100 cancellation fee will apply. The Property Manager will make every effort to ensure the property is available as booked. However the Property Manager reserve the right to make alterations to bookings due to unforeseen circumstances. Number of Guests should not exceed the number stated on the Confirmation Notice or subsequently agreed in writing or email. Fees will apply for excess guests not agreed with the Property Manager in advance. Parties and Functions are strictly prohibited. The price charged is for domestic use only and not commercial or for functions including weddings. Accordingly this rate does not allow for the extra wear associated with functions in terms of cleaning, garbage removal, wear and tear, repairs etc. Use contrary to this may result in loss of your bond and/or additional payments. Departure - the property should be left in a similar state to its condition on arrival. Check -in time is 15:00 and Check-out time is 10:00 by the latest, to allow time to prepare property for next guests. Unless agreed with the Property Manager prior to arrival. Bond is payable at the same time as the balance amount by direct deposit. It is designed to cover any additional costs incurred including but not limited to, any breakage, damage or excess cleaning requirements, extra guests beyond those declared ..etc. All linen and Manchester will be provided, except for beach towels. Pets are not allowed unless specific arrangements have been made in writing with the Property Owner.